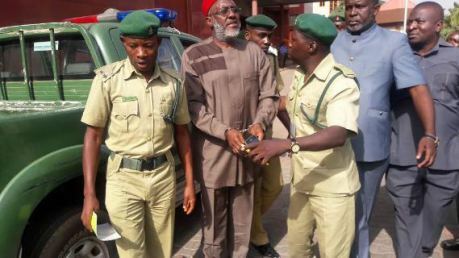 Monday the Economic and Financial Crimes Commission (EFCC) opened its case of money laundering and corruption against the National Publicity Secretary of the People’s Democratic Party, Mr. Olisa Metuh, at the Federal High Court in Abuja. The charges of money laundering involves the sum of N400m, which he allegedly collected from the National Security Adviser (NSA) in November 2014. The case was opened with two witnesses Nneka Ararume and another unnamed witness, who both explained how they helped the defendant exchange $2million into Nigerian currency and later invest it. Ararume, the first prosecution witness, a wealth manager at Dextra Investments Limited testified that she collected the sum of $2million dollars from Mr. Metuh sometime in December 2014. She then exchanged the dollars into Nigerian currency and had it transferred to Mr. Metuh’s account. The second witness, a bureau de change operator, stated that he had the sum of $1 million dollars exchanged to N183 million; which he then transferred to Dextra. The bureau de change operator further stated that he had no prior knowledge of either Mr. Metuh or his company (Dextra), before that time of their transaction.